Also known as myopia, this is the ability to see up close throughout life without glasses. However, these individuals require distance glasses their entire life. 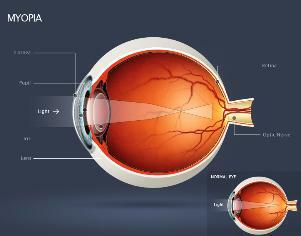 As noted in the diagram, light rays from a distant target are focused in front of the retina. These individuals require minus (-) lenses in front of the eye which can range anywhere from –.50 to –14.00. Any prescription higher than–4.50, however, will probably require the patient to hold things to close to the face in order to see them clearly and will be more comfortable with his glasses on. This condition results from the eye being too long (the longer the eye the higher the minus lens required). Also known as hyperopia, this is the ability to see up close and in the distance up until a certain age without glasses. When that certain age is reached, the vision will become blurry at distance and near. As noted in the diagram, light rays from a distant target are focused beyond the retina. These patients require a plus (+) lens in front of the eye to see clearly which can range from +.50 to +14.00. This condition results from the eye being too short. The shorter the eye the higher the plus lens required and the earlier in life the individual will require glasses. This refers to corneas which have an irregular shape. In people who do not have astigmatism, the eye has the regular curvature of a basketball. With astigmatism the eye has more of the irregular curvature of a football. Note in the diagram that light rays are focused at all different locations in relation to the retina. Therefore, patients with astigmatism almost always require glasses.